I have been using this amplifier since 2002 and it is still going strong. I cannot say enough good things about it. It has great detail and rhythm and pacing but at the same time it has an almost tube-like warmth. Vocals, especially female voices, are amazing. I would recommend this amp if someone wants the benefits of tubes without the hassles and reliability issues. I will keep it till it dies but I worry that I will not be able to find an amp that equals its performance without spending really big bucks. The only real competition for this amp is the Rega Brio, which is an excellent amp but is a bit more finicky to match with other components. I highly recommend this amp, which has now stood the test of time in my system. It is far and away the best amp I have ever owned. I am currently using the Arcam A65+ in a passive bi-amp configuration with a Rotel RB990BX powering the low frequencies. I wasn't sure, without an active crossover if it would make a big difference. Well, I will be satisfied for at least a couple years in my endless pursuit of audio perfection, but now I'm set on getting separate Arcam amps for the highs and lows. I have had many "mid-fi" amps, integrateds, and pre-amps. Most in the $800-$2000 range. I am sourcing this pairing with a Squeezebox Duet to a Denon DVD-9000 as a DAC and CD player. I am using the wonderful Sapphire ST2's with a Velodyne SPL-R in a 2.1 Config. I didn't used to care about anything other than how a component sounded. Looks didn't matter. With the Arcam, I can say, I am very pleased with how it looks on the rack and now I'm addicted to that "Arcam" sound. 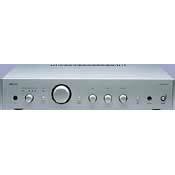 Even if you just need a stereo pre-amp these can be had, now, for less than $300, and will surpass all in that bracket. The amp is scrumptious, to boot! Soundstaging is on par with the best I have heard. I think the A65/A75 are the best looking units of em' all. I'm a customer for life! Well, until I can afford a Linn. I don't even look at much else on ebay anymore. Great warmth, if that floats you boat. Refinement and control. High build quality and good looks. Great warmth, if that sinks you ship. Some silly extravagances, like tone controls - really, who needs them? I would have spent the money on a bigger transformer. A simpler switch for source selection would also cut costs. Be careful with partnering. Having heard the first A65 model briefly I can agree that the A65 plus offers at least a marginal improvement. Though I have not really had a great chance to test this unit in full swing (ie. with a high quality source) it's quality is undeniable. To label this product as anything less than audiophile grade shows a little snobbery, even though one could certainly find better equipment with a greater budget. Warmth and finesse spring to mind here. Of course, Arcam is famous for this but I did not expect such distinct characteristics. This would be great for jazz listeners but would perhaps put fans of rock at a disadvantage. It is arguable that there is a certain loss of resolution as a result of this warmth - the mid-range is far more generous than with some other integrated amps, and this could be heard to undermine the clarity of the treble and minimise bass presence. However, soundstaging seems pretty good even though separation is not the very best in town. It also strikes me that the sound is a little bass light, even though bass response is fast and fairly tight. Then again, perhaps this is my meagre source equipment speaking. Build quiality is superb and cosmetics are attractive. There are adequate inputs and the pre-out provision is pleasing. Binding posts are also of high quality. One thing I will never understand though, is why on earth a company like Arcam insists on wasting money on tone controls and fancy source select switches. Oh well. All-in-all, this is a great product. Just take care wih partnering equipment. Try to find fairly neutral source components and perhaps a sassy pair of loudspeakers that don't take much driving and will provide plenty of treble insight. headphone sound poor, rear speaker terminals - where do you get things that plug into them? Great mid-range amplifier. With Arcam, as with other small specialist manufacturers who rely on their products performance and reputation with users instead of their multi million dollar marketing budgets, you get what you pay for, more importantly you get what you expect. While not strictly an audiophile product, its performance is far better, at the price, than what you get out of people that make dishwashers, cameras, and audio equipment. Previous reviewers, except one, have given an adequate description of this product's attributes. I read all the reviews and then tested the product ( along with others) and found it to be accurate in keeping with the general flavour of these reviews. great natural midrange, not too flabby at the bottom end, and good precision in placing instruments and vocalists. I plan to upgrade with one of the Arcam power amps to bi-amp before going one up again in system ( it's a never ending cycle). One thing to note is that the headphone output - a direct feed from the pre-amp I guess, is not that crash hot. Compared in this regard to the NADC320BEE it sounds thin and tinny. It would suggest Arcam do their magic on the output stage. If you've got about USD 500 to spend you should listen to this one. Drives my 87dB standmounters with no problems. Warmth, superb accuracy and definition, sounds "like the players are in the room" quality. Another 10 watts would be great, or perhaps more capacitance in the power supply. As an entry level audiophile wanting to move away from mass market gear ( NAD/Yamaha) and into the low "high end" I researched far and wide at all options for a 2 channel integrated that would match other system gear ( present and proposed)and provide upgradability. Looked at Rotel 1060 ( well built and powerful but it did not provide detail, and the sound was not quite "natural", particularly the midrange), Creek 5350 ( very good in terms of dynamic range and accuracy, light years ahead of Rotel, at a higher cost - particularly with jazz/instrumental- but could not help feeling some of the music was missing), Arcam 75 ( powerful but not quite there in detail, soundstage accuracy or warmth), Rega Mira ( cheap construction, almost too warm and laid back), various other mosfet based integrateds and some bottom end valve units, and finally the Arcam 65 plus. All the above were tested with various floor standing speakers in the multi $1000 range ( B&W CDMNT's, JM Labs, Kplisch, Whatmough,etc) I got the Arcam 65plus. Tested with more than one speaker and on more than one occasion it offered the warmth (close to valves), midrange accuracy, dynamic range ( even though it's a 40 watter)pinpoint positioning of instruments and vocalists and musicality that all other candidates failed to deliver to some degree. The second comer was the Creek, at double the price. The Arcam did have something else going for it which others did not, you simply want to keep listening to it. Even the retailer felt the same way ( even though he could have pushed other products), and in fact kept the unit playing after I left the shop. In my opinion that is the best indicator of a good amplifier. Yes it could do with more power, and perhaps more reservoir in its power supply as it will loose the bottom end a bit it at very high volumes ( I should stress at a volume level far higher than you would use to wake up the neighbours). For the budding audiophile on a budget it's worth a listen. I plan to upgrade to a power amp stage in future to round off the system, before upgrading to CARy monoblocs or similer. BFA connectors for speaker connections. Can't power unit on/off with remote. NAD, Rotel, Adcom killer! This amp is great.Got out of an ill fated attempt at home theater, and bought this amp after leaning towards the Audio Refinement Complete (twice the list price). Paired with my Paradigm Reference Studio 20's, the amp cooked. I then switched to a pair of ProAc Tablette Reference 8's and the room was transformed into a concert hall. The soundstage opened up and I heard definition that I never heard with my NAD separates/Paradigm setup (pre-home theater). A great starter or second room system. this is one of the models that i tried out while shoppoing for a second stereo set and it proved disappointing. partnered with my jm lab speakers it sounded weak even through those efficient speakers. it sounded worse than the alpha 5 amp which i used to own. it also lacked power and refinement and in the end i bought the cyrus 5 which sounded very much better in every aspect. i would put the likes of creek, rega, cyrus and roksan to be much better buys than the arcam. Warm yet detail and refined sound, excellent bass control and natural sounding midrange. Great sound and build quality. I have used the Arcam A65 amp for several months now and it has performed vey well. It has a balanced and detailed sound and good punch for 40wpc. It is being used with an NAD cd player and AE Aegis Ones, this combination sounds very good. It sounds very natural and accurate, not coloring the sound. The build quality is solid and very good. I would definately recommend this amp in this price range.